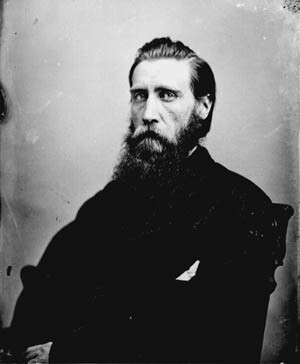 John Bell Hood was wounded in both body and spirit when he took over command of the Confederate army at Atlanta. It was an omen of things to come. When Confederate general John Bell Hood assumed command of the embattled Army of Tennessee at Atlanta in mid-July 1864, he was already grievously wounded in both body and spirit. He had lost the use of his left arm at the Battle of Gettysburg, and two months later he lost his right leg at Chickamauga. But he was suffering at least as much from a wound that no one could see—a frustrating and ultimately heartbreaking love affair with South Carolina belle Sally Buchanan “Buck” Preston. It was a battle the ill-starred Hood was least equipped to fight. The tall, handsome general from Kentucky had first met the beautiful young socialite in Richmond in the winter of 1862-1863, when she was in the Confederate capital visiting friends. At the age of 31, Hood was a dozen years older than Buck Preston chronologically, and even farther behind her in drawing-room polish and dance-floor flirtations. His first compliment to her was typical of his lack of romantic savoir faire. Miss Preston, he said, “stood on her feet like a thoroughbred.” What the cultured young lady thought about being compared to a horse is anyone’s guess. Hood persisted. Despite being turned down twice by Buck, the sad-eyed general kept after her, managing to win a somewhat shaky acceptance. “I am so proud, so grateful,” he told Mary Chesnut. “The sun never shone on a happier man.” The worldly Chesnut was not convinced. “So the tragedy has been played out,” she recorded in famous diary. “I do not think even now that she is in earnest.” It did not speak well of Buck’s devotion that when Hood attended church with President Jefferson Davis before leaving for Atlanta, Buck did not look at him once during the entire service. In the end, the “Gallant Hood” had not been gallant enough. He lost both the war and the girl. Who can say which hurt more? Tags Battle of Chickamauga, Battle of Gettysburg, Confederacy, Confederate Army of Tennessee, general john bell hood, Jefferson Davis.